Jun. 30, 2018 11:40 a.m. Most have heard of the downward dog position in yoga – whether they’ve actually tried it or not. Well, 10 people tried out the modified downward facing kitten pose today (Saturday) in Aldergrove. Much like kittens, instructor Ann Marie Walsh wants her students to learn to stretch and push the limits throw yoga. “Think of it as being curious as to how your body can move and respond to the different poses,” said the Langley City resident, who is leading a new kitten yoga program over the next five weeks as a fundraiser for the local animals shelter. Animals have been incorporated into a number of yoga programs in Langley recently, including goats and pigs. But, as far as Walsh is aware, her new kitten yoga classes, which she started today in Aldergrove, is a first – at least locally. Kittens will be a part of each class, she said, explaining how – through the years she was involved in “high intensity” physical activity for example running, triathlons, cycling, and swimming. Four years ago, at the age of 54, her pattern of working and playing hard was starting to take its toll on both her body and mind. “Yoga was something that my doctor had suggested as a way to alleviate stress and reduce my cholesterol levels,” she recounted, noting she’s already been practising meditation for a number of years. The combination changed Walsh’s life – and yes it reduced her cholesterol and decreased her stress levels – and now she’s endeavouring to help change the lives of others by sharing what she’s learned. So how did she come up with the idea for kitten yoga? Admittedly, it’s not new initiative. It is done in other parts of the world. But Walsh said her inspiration came from her daughter’s kitten, Luna, who was adopted more than a year ago from the Langley Animal Protection Society. Her daughter, Lydia, did some research and liked what she saw and heard about LAPS. Today, they insist they were able to find the perfect kitten. In the process of Lydia learning more about LAPS, so too did Walsh, who said recently came up with this unique way to support LAPS – and specifically the homeless, neglected, and abandoned animals in Langley. 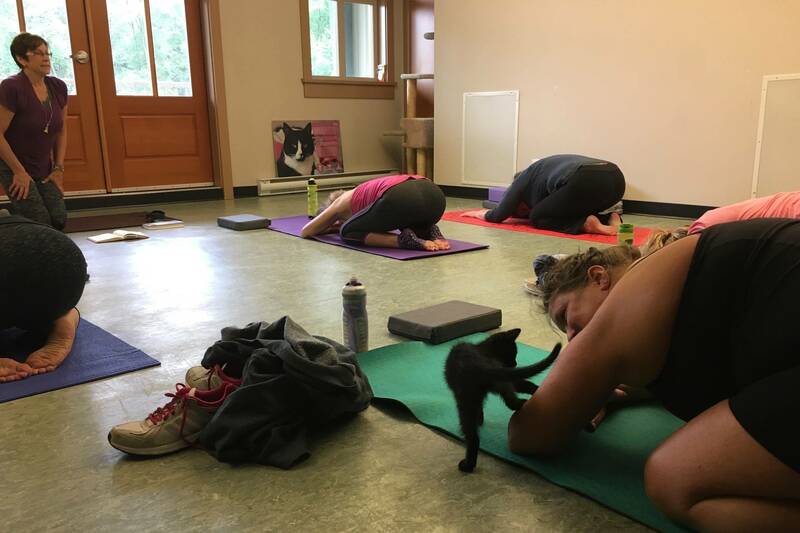 “I teach and love yoga and love animals and felt this was a great combination… and we now have kitten yoga,” she said, giving all the money from course registrations to LAPS. She’s convinced the infusion of kittens to the yoga program will offer students some insightful perspective into the practice of yoga. If these sessions go as well as she expects they will, today and over the course of the next four weeks, Walsh would love to expand on the concept.